Lying in the calm, warm waters of Van Phong Bay, just an hour north of Nha Trang, Diep Son is a mini-archipelago of small green islands. At low tide, a curving sandbar is exposed, linking three of the islets via a ‘sand bridge’. 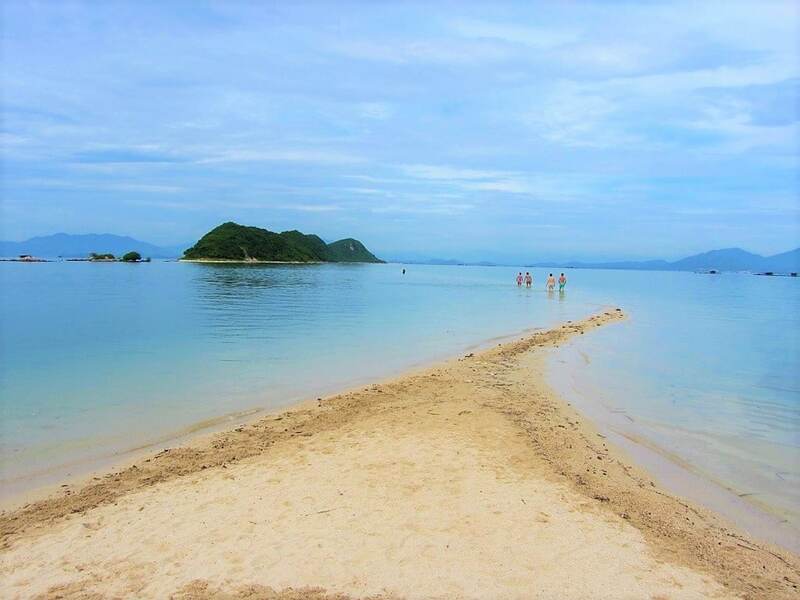 The long sweep of white sand between the three green islands in the blue bay is very picturesque. Although Diep Son is increasingly popular with domestic tour groups, it’s best visited independently, because this way you can avoid the crowds. 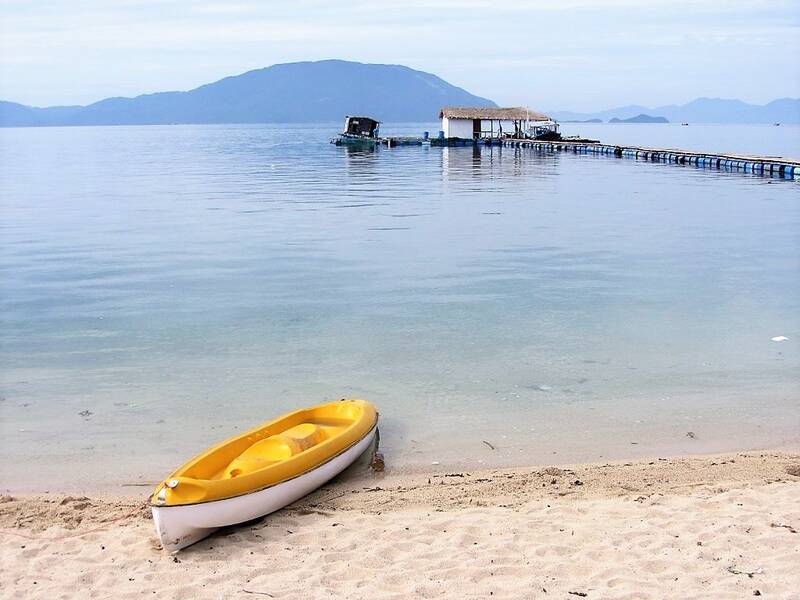 Travel to Diep Son is an easy combination of road and sea transport between Nha Trang city, Van Gia village, and Hon Bip island. Diep Son makes a good day trip from Nha Trang, or as part of a wider exploration of Van Phong Bay and the surrounding area (see Related Posts). 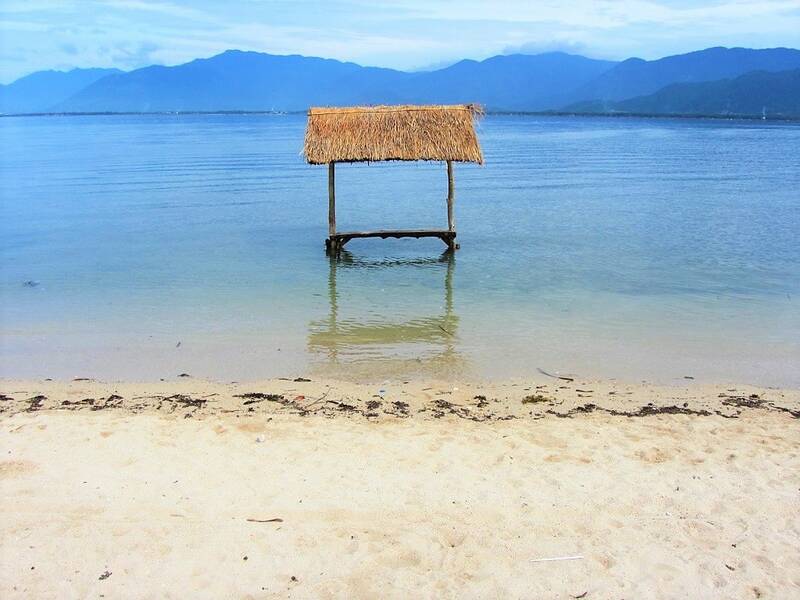 A great option for budget travellers is to spend the night on Hon Bip island in a tent or bamboo hut on stilts above the water. Not long ago, one of the many drone cameras showcasing Vietnam’s natural beauty from above, flew over Diep Son. The resulting video went viral on Facebook: everybody wanted to know where Diep Son was and how to get there. Now, hundreds of people take the boat across Van Phong Bay, from Van Gia to Diep Son, every day. 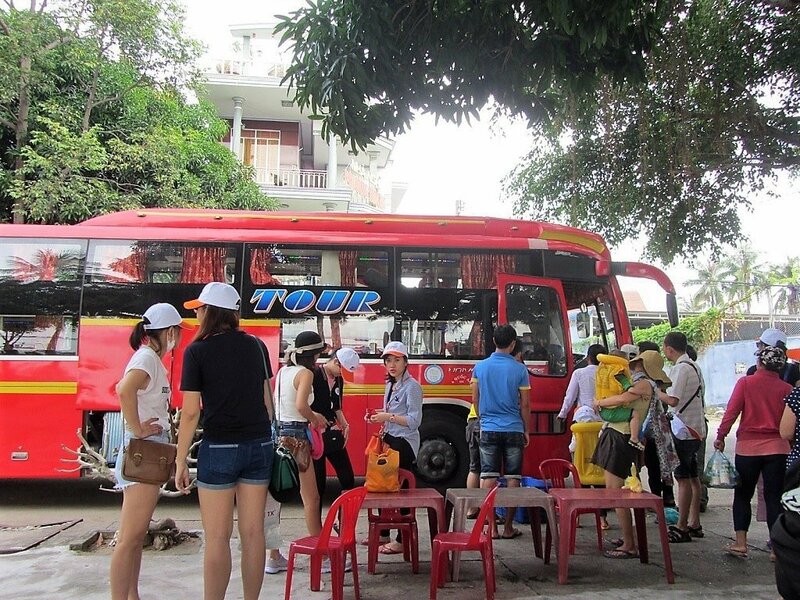 The vast majority are domestic travellers – either as part of a group tour or phượt (independent road-trippers). This means that, on the one hand, getting to Diep Son is pretty easy and hassle-free, but on the other hand, you feel like you’re on an organised tour. However, if you travel at the right time of day and, especially, if you stay the night on the island, it’s still a very rewarding, scenic, and worthwhile trip. 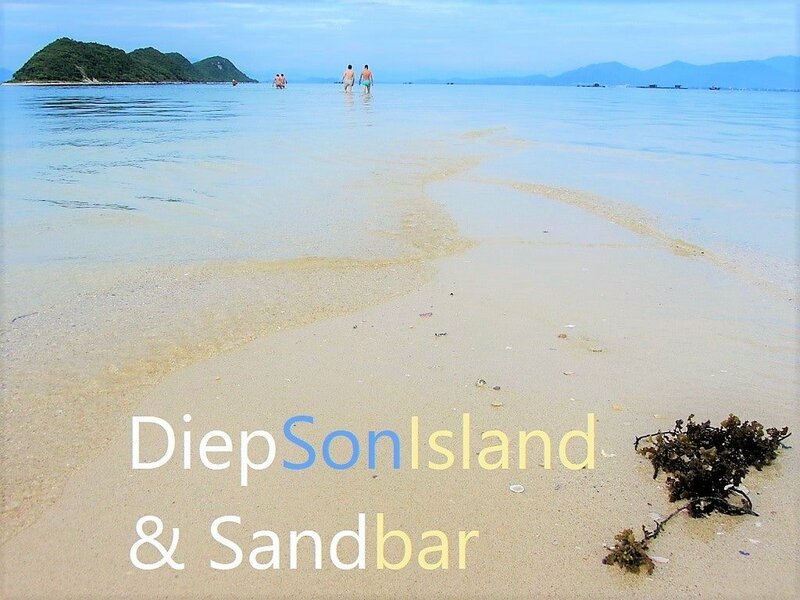 Although most hotels and guest houses in Nha Trang can arrange a tour to Diep Son, I recommend doing it independently. There are several daily local buses between Nha Trang, Ninh Hoa and Van Gia, from where you can walk to the port on the seafront to get the boat to Diep Son (inquire about bus times at your hotel in Nha Trang or at the Nha Trang bus station). However, by far the most exciting way to get to the port at Van Gia is by motorbike (or, if you have the time and energy, by bicycle). 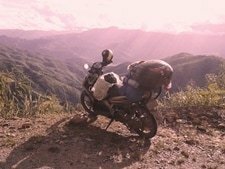 If you don’t already have a motorbike, most accommodations in Nha Trang can arrange rental for a day or more (100,000-200,000vnd per day). The drive from Nha Trang to Van Gia is mostly on Highway 1, which, although heavily used by trucks, is in good condition at the moment, making the journey a smooth, scenic, relatively low-stress 60 to 90-minute drive. 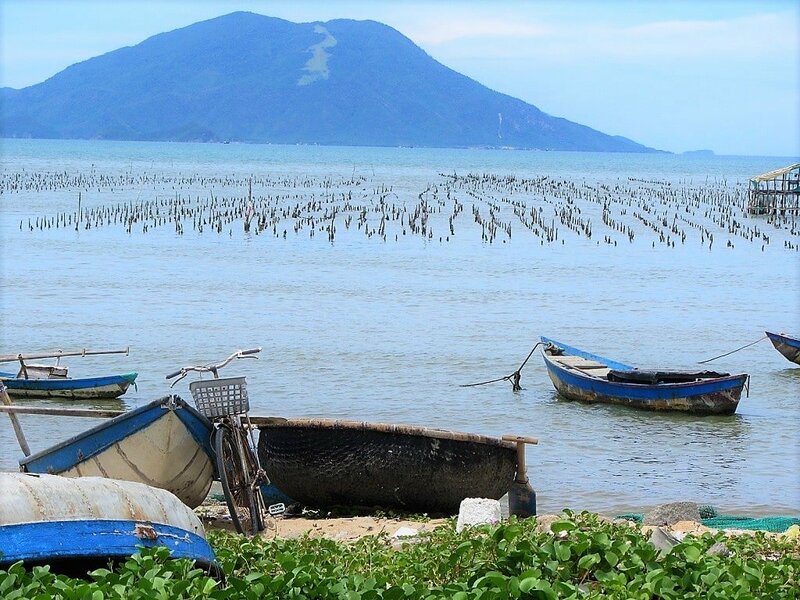 Van Gia is 60km north of Nha Trang, located on the coast at the centre of Van Phong Bay. The attractive seafront road (Tran Hung Dao) is lined with swaying coconut palms, under which wooden fishing boats bring in the night’s catch and undergo repairs. The road is dotted with shady cafes, eateries and a few mini-hotels. At the middle of the waterfront, Van Gia port (cảng Vạn Gĩa) is where boats leave for Diep Son (look for a large sign saying Điệp Sơn Quán [Diep Son Restaurant]). Van Gia is only used as a transport hub for boat connections to Diep Son. But, if you have a night to spare, it’s not a bad idea to spend it here. Van Gia is an interesting little place that is, in all probability, on the cusp of major development, thanks to its position in the middle of the bay and proximity to the islands. Indeed, the new seafront road was surely constructed with this in mind. However, it still has a refreshingly local feel. (At some point, many years ago, this must have been what Mui Ne felt like, before the arrival of mass tourism.) Local people are friendly, the backstreets are dotted with cute little red-tiled homes, the harbour is full of fishing boats, and the main town (a few blocks back from the sea) has everything you need: banks, street food, a supermarket, motorbike garages. A sleepy town during the day, Van Gia’s seafront comes alive in the late afternoons and early evenings, when the sun is low, the light pink, and the breeze is wonderfully refreshing; children frolic in the surf and play in the sand, while parents and lovers lie back in deck chairs under the trembling sails of coconut palms, munching on hot snacks served from illuminated food carts, and sipping freshly pressed sugar cane juice….and everybody leaves their trash strewn over the sand or thrown into the sea (sigh). Good-value rooms are available at all the nhà nghỉ (local guest houses) and mini-hotels along the seafront road, from where it’s a short walk to the boat pier. 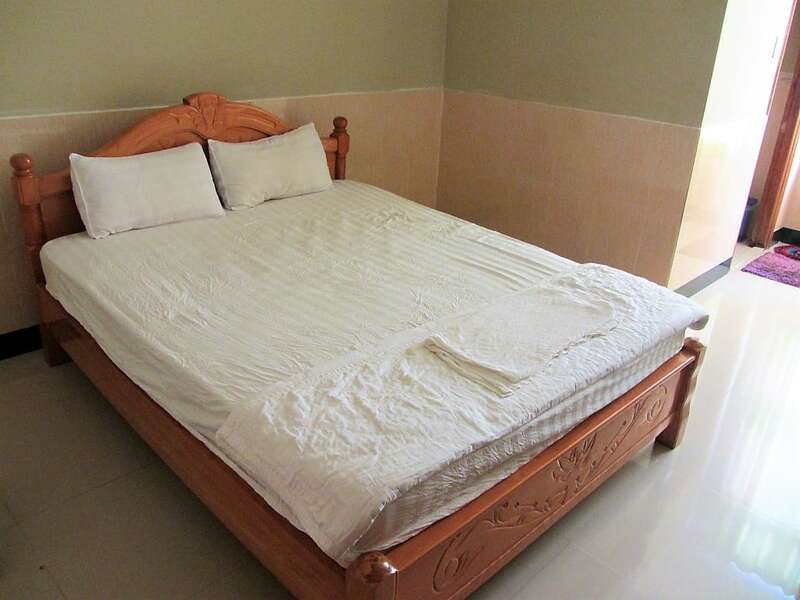 The standard price is 250,000vnd for a clean, plain room with a window and hot water shower. I like Gia Huy Hotel (2 Tran Phu Street; 0583 708 686). Nha Nghi Phuong Hoang (0122 553 7707) has two locations, including one conveniently located directly opposite the boat pier, but they were very rude to me. Seafood is served in several eateries along Tran Hung Dao and there are a couple of good cafes on the backstreets leading from the seafront, including the lush Cafe Moc. 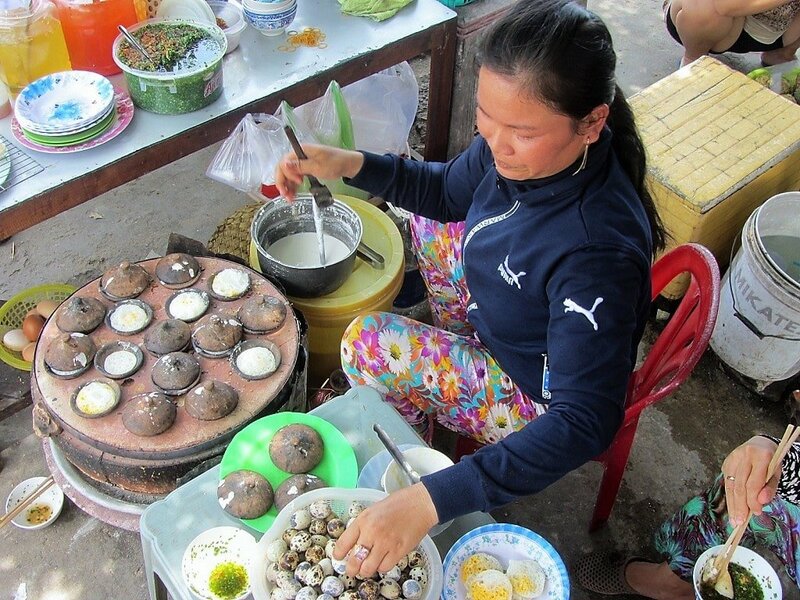 Don’t miss Ms Hậu’s bánh căn (spongy, savoury rice flour and quail egg cakes dipped in ‘special sauce’) under a tree on the corner of Tran Hung Dao and Nguyen Binh Khiem streets (11am-4pm; 10,000vnd per 10 cakes). Another advantage of staying the night in Van Gia is that you can catch an early boat to the islands the next morning. Buying a ticket is quite easy and well-organized. 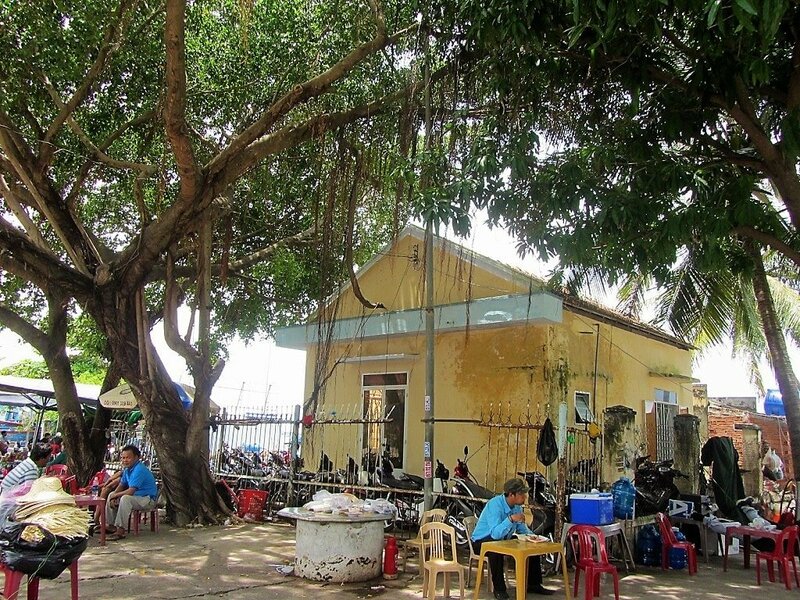 Tables selling tickets set up by the port, under the shade of a large tree, next to the ‘Điệp Sơn Quán’ signpost. You can’t really miss it, because there will be coaches and minivans all around. Boats leave at regular intervals from 7am till lunchtime (around midday). As the afternoon progresses, there are fewer boats leaving to the islands, because, by that time of day, most day-trippers are on their way back from the islands to Van Gia. There are two kinds of boats: fast speed boats (and they really are fast), and much slower wooden boats. 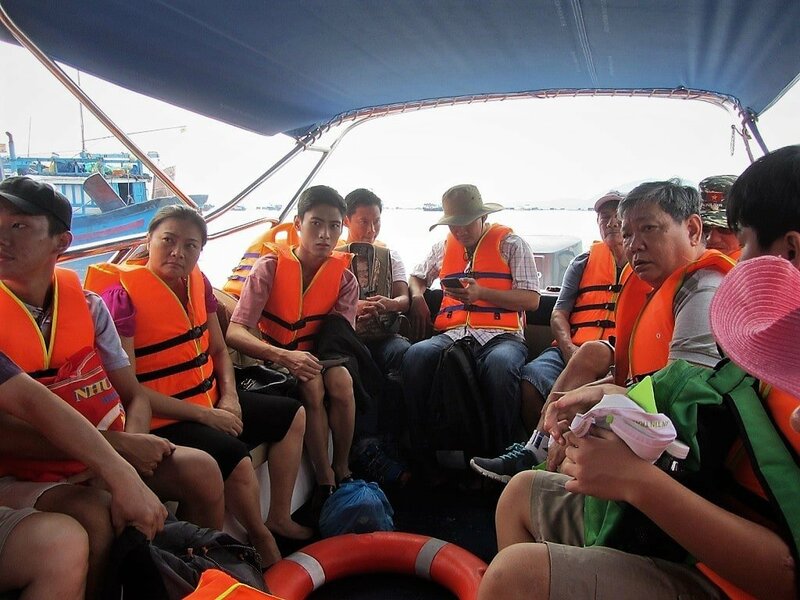 Tickets for the fast boats are 200,000vnd return and journey time is 10-15 minutes. Tickets for the slow boats are 100,000vnd return and the journey takes at least 30-45 minutes. 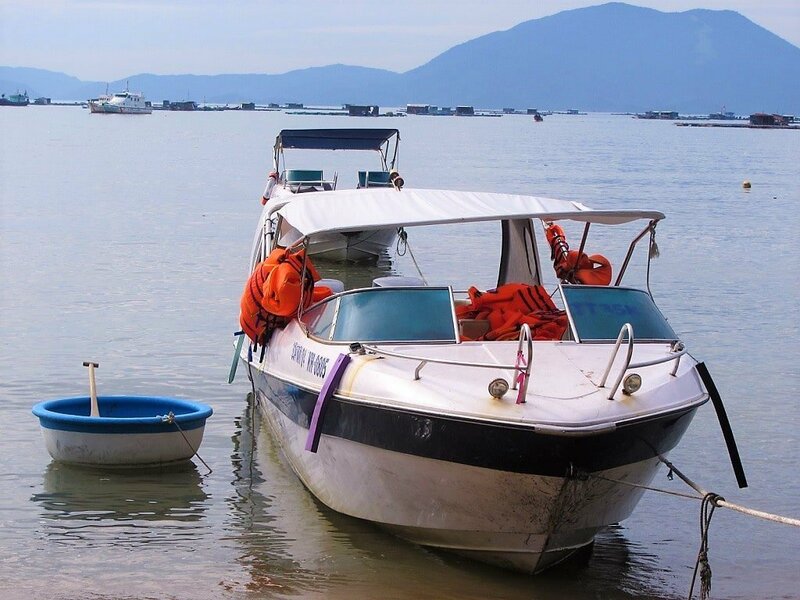 As an independent traveller, it’s generally best to get the fast boat, as most of the slow boats cater to large tour groups who meander their way from Van Gia via other sights in the bay before arriving at Diep Son. (You may need to show your passport when buying a boat ticket, although I’ve never been asked to.) All boats are for passengers only: there are not vehicles, of any kind, allowed. If you have a motorbike or bicycle, you can park it securely at one of several giữ xe (parking lots) opposite the boat pier (10,000vnd per day; 20,000vnd overnight: don’t lose your parking ticket). The speedboats can accommodate around 20 passengers and, in theory at least, won’t leave until they are at least half full. In the mornings (peak time), you’re unlikely to have to wait for the boats to fill up, as there will be dozens of people waiting to board. But, in the afternoons, boats are less likely to sail with only a few passengers. The speed boats appear to be fairly modern and are equipped with life vests. However, Vietnam’s maritime safety record is appalling, and some of the boat drivers are disgracefully irresponsible: on one of the boats I was on, despite having a frail octogenarian seated at the front, the driver went as fast as he could, cutting in front of every vessel he overtook as close as possible to their hulls, and directing the boat into as much rough surf as he could. Fortunately, it’s all over in a blur, because the boats are so swift, but this is something to bear in mind if you don’t have good sea legs. Most of the boats moor at a long pontoon pier on Diep Son Island (also known as Hon Bip), the largest of the three islands in the mini-archipelago. Some boats also dock at Diep Son hamlet, which is just a short walk from the pontoon pier. (For the return journey, boats leave whenever there are a handful of passengers to take back to Van Gia. However, it’s difficult to get a return boat in the late afternoon). 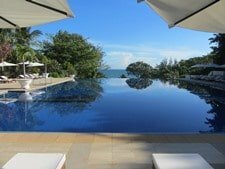 If you arrive in good weather, the island is a beautiful sight, rising from the flat, silky waters of Van Phong Bay, ringed with sandy beaches, one of which stretches out to sea in a curve, forming a sand bridge to the other islands, for which Diep Son is famous. 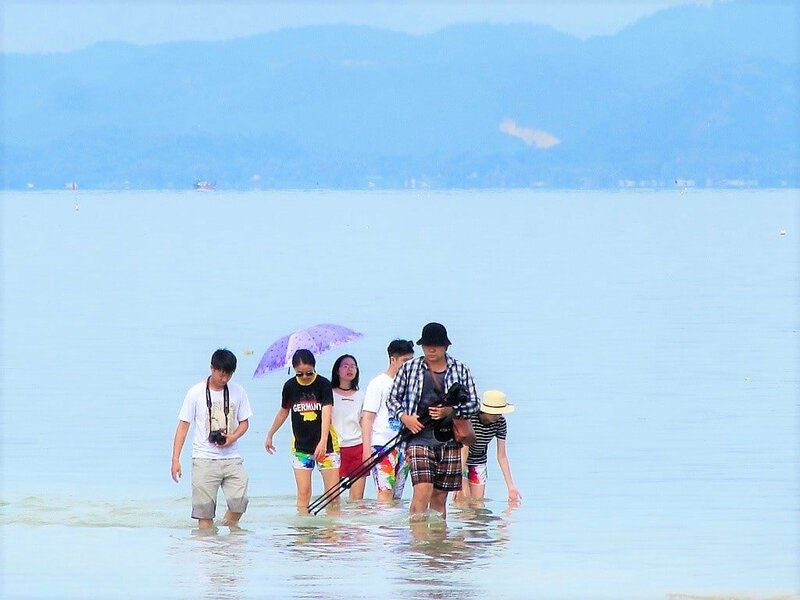 For Vietnamese tourists, this is selfie heaven, and the majority of visitors tend to spend most of their time on the island posing for social media-bound photos. There’s not much in the way of infrastructure on the island yet. A generator provides electricity throughout the day until about 7pm. A long, palm-thatched restaurant serves decent and quite reasonably-priced meals (including seafood) and drinks, as well as offering water sports, such as kayaking (a lot of fun on these calm waters), jet skis, snorkeling, and fishing. There are a couple of isolated drink and snack shacks on the other two smaller islands (accessed on foot via the sand bridge). At the time of writing, there were several other small-scale developments underway on all three of the islands, so expect a lot of changes over the next year or two. Swimming is good. The water is shallow and calm so most people feel confident about taking a dip and, the main attraction, wading across the partially submerged sandbar to the two smaller islands. The water quality is still fine, although there’s an increasing amount of garbage lying in the surf, because day-trippers, who often bring their own picnics, tend to discard their trash by simply leaving it on the sand or throwing it in the sea (and there’s a fair amount of fishermen’s detritus too). 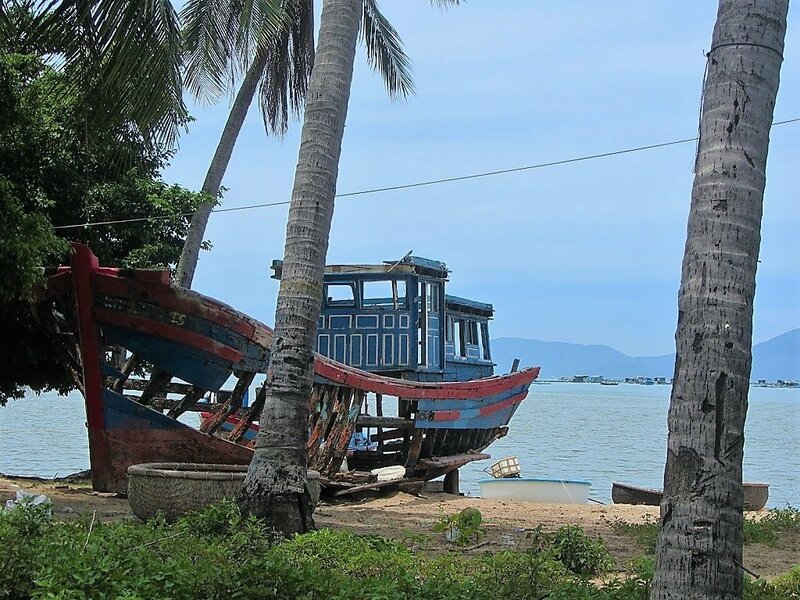 However, trash has yet to overwhelm and ruin Diep Son as it has other popular sights in Vietnam: it’s hanging on, but it’s very fragile indeed. The interior of the islands is green, but also rocky and arid. Near the coastline, there are mango and calabur cherry trees, but further inland these are replaced by cacti, eucalyptus and, intriguingly, volcanic rock. If you want to experience Diep Son without the ‘selfie hordes’ and tour groups, consider staying the night on the island. Accommodation is basic but atmospheric and very reasonably priced. 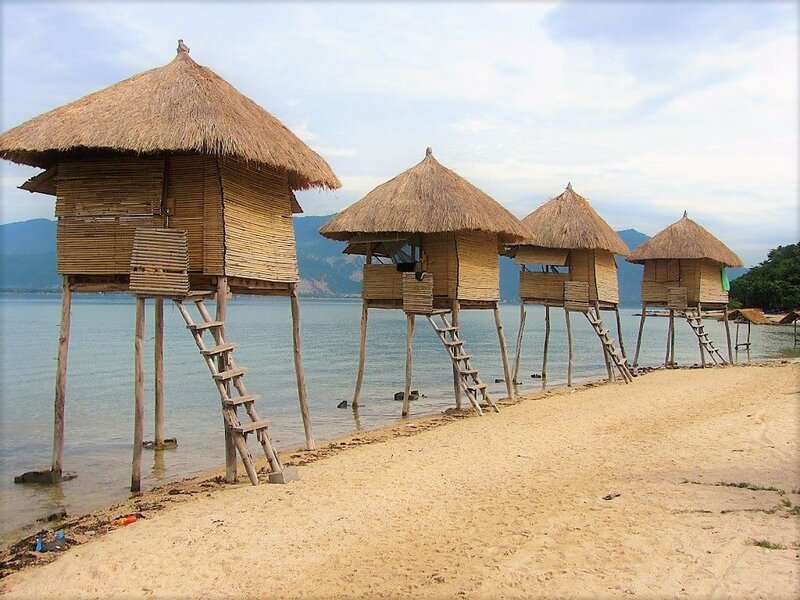 Choose between a rented two-man dome tent on the beach (200,000vnd for two people) or a mattress under a mosquito net in a bamboo cabin raised on stilts over the water (400,000vnd for two people). 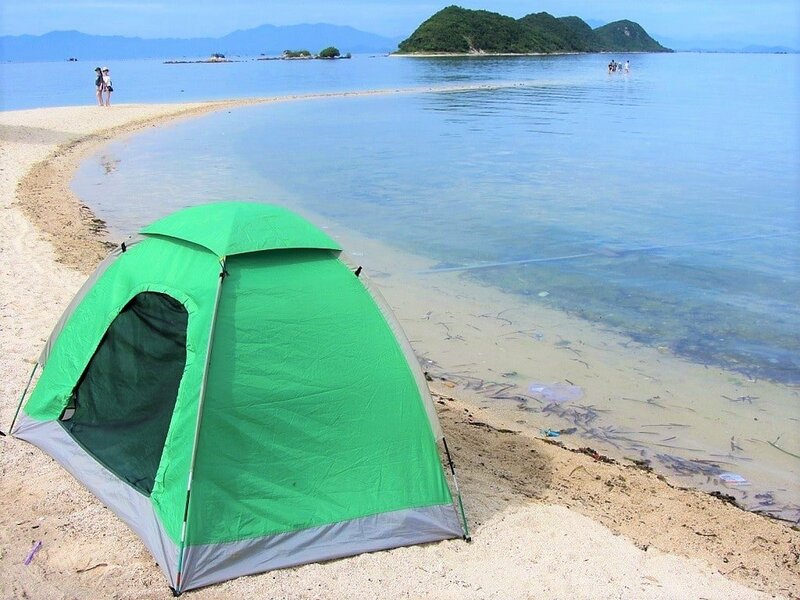 Or, you can even bring your own tent and pitch it anywhere on the beach for free. Do this and you’ll have the entire island practically to yourself for the evening, night and early morning (unless a group of phượt travellers are also camping, but they’re usually young and good, fun company). Showers and bathrooms are OK, and the restaurant can serve you dinner and breakfast. 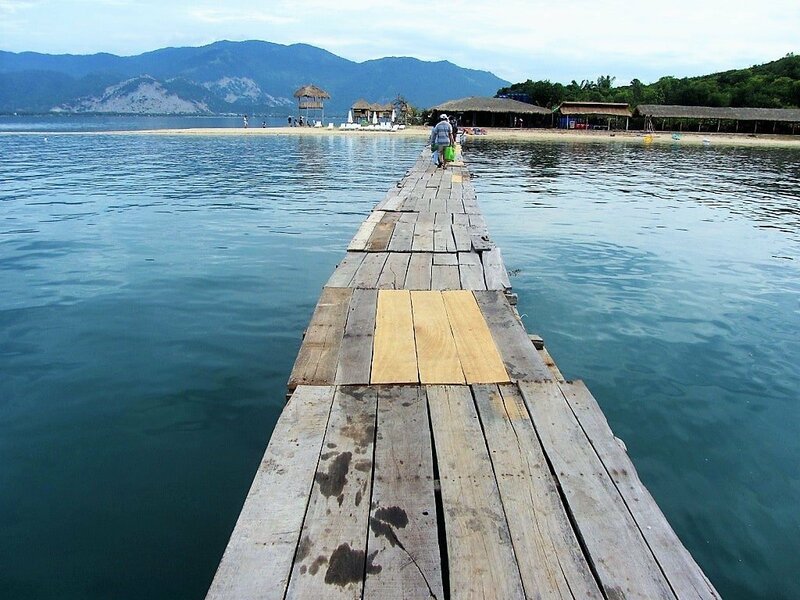 Accommodation is arranged at the Diep Son Restaurant (0914 39 39 79) at the end of the pontoon pier. Diep Son is, without doubt, a beautiful place and worthy of its new-found fame. While I was waiting for the boat to leave Van Gia dock, watching busloads of tourists arriving from Nha Trang, I was worried that the islands would be too crowded (and too littered). But this turned out not to be the case, at least until lunchtime. And, although litter is a problem here (as it is in almost every popular tourist destination in Vietnam), it wasn’t bad enough to spoil the experience, and there were some encouraging signs of people clearing up their own trash. If you stay the night on Hon Bip Island you will almost certainly enjoy the experience, but if you happen to hit the island and the wrong time of day, you may be disappointed. However, there’s something temporary and even desperate about both the hastily-assembled infrastructure on the islands and the massive and sudden influx of domestic visitors: it’s almost as if everybody knows that this mini-archipelago is destined to fall into the hands of some huge, luxury developer, and so it’s crucial to visit now, before it becomes the preserve of the wealthy and the few. This entry was posted in ALL, Beaches, DESTINATIONS, The Centre and tagged beach, boat, Diep Son, Hon Bip, island, Khanh Hoa, Nha Trang, travel, Van Gia, Vietnam. Bookmark the permalink. I always enjoy reading your posts and got especially excited about this one. I planned to go there next week, then read the update about the typhoon. Super sad! Have you been there recently and can give an update on the current situation? Accommodation available, and still worth a visit? I haven’t been to Diep Son since the typhoon, but I would imagine that things have been repaired to a certain extent by now. If you do decide to go, please share any updates here. What’s the next best stop after Diep Son. I am visiting the island tomorrow and want to move on when I get back and would like to know where is the best place to go next if you are heading north? Heading north after Diep Son go to Hon Gom Sandbar, Dai Lanh Beach, and Vung Ro Bay. After that it’s all about the Beaches fo Phu Yen and Quy Nhon. Visiting Diep Son in October should be OK, but Vietnam has had a lot of rain this year, so check the weather forecast before you go. 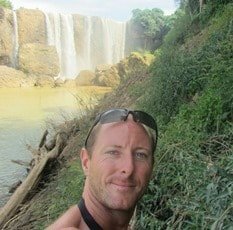 Here are a few updates on Diep Son and Gia where my wife and I spent two nights and two days in late December. The recent typhoon in November seems to have hit the area hard. Based on your pictures, the pontoon at the has been rebuilt since your visit, and I suspect it was also the case for the restaurant. Many houses on the island were torn down; in Gia itself, all houses between the seafront road and the sea were destroyed, although we can’t tell whether it’s due to the typhoon or some development plan. It looks like there’s no more slow boat going to the island, but it remains to be confirmed. The speedboat tickets are now sold at an unmarked booth, a few meters away from the pontoon at Gia’s harbor. As it’s currently the low season, we had to wait a long time until there were enough people to fill up the boat. The sandbar wasn’t over the water at the time we visited; again we don’t know if it was because we didn’t get at the right time of the day, or if the typhoon also damaged the sandbar itself. The sleeping huts you mention seem to be gone, again due to the typhoon. In spite of this slightly deceiving visit, we really enjoyed Gia itself. The part of the city close to the harbor was at the same time lively and rather peaceful. Food was good, smoothies were excellent, and overall people were friendly. Contrary to many smaller fishing villages, it was easy to find food after dark ! Thanks for the updates. That’s very sad to hear about the destruction. I’m sure it is mostly due to the typhoon, because Diep Son was right in the middle of it. But glad to hear that Van Gia still has a good vibe to it. Those kind of articles are really great, thank you for the useful information! 🙂 May I ask for your advice too? I’m visiting Vietnam for the first time in the beginning of November with my boyfriend, but we are only going to stay for around 12 days. We’ve made this plan for the trip, but I guess we’re including too many places, considering the time we have. In your opinion, which ones are worth the visit? Yes, you’re probably right: that’s a little bit too much for 12 days. Perhaps base your itinerary loosely on the idea that you’ll want/need to spend 2 days in each of your destinations. Personally, I would choose between Phong Nha and Hue. The weather is often not too good in those areas at that time of year, so just choose one of them, not both. Also, you could choose just one out of Halong Bay and Phu Quoc, because they are both beach/coastal destinations. 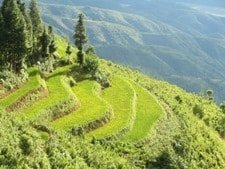 I recommend taking internal flights between north, central and southern Vietnam. This will save you time, and competition among domestic airlines keeps airfares quite low. Good idea to refer to tide chart before going to avoid disappointment! Yes, good idea. Although personally I think the islands look great and are worth a visit at any time of day, no matter what the tide is like. I will definitely go there again outside the local holiday season – people in the village were extremely polite. Yes, good idea. I’m sure it’s quieter outside of peak domestic travel season. 1. Was told the 1st departure from Van Gia was 7am however we had to wait until 0810am and there were plenty of people. 2. I was there on the 23 Mar 17 and yes the boat driver was like majority of local motorbike drivers, and when I ask him to be more careful, he just look at me, as I was a crazy man! 3. The beach especially from the pontoon bridge and out to the other bridge was extremely dirty, and it was not garbage coming in overnight – it was including 3 goat kids, which had been there for days. 4. We experience one of the slow boats arriving at the fixed bridge close to the school and that only had local passengers and a lot of cargo – equipment for fishing and several cbm. of ice for the fishing boats leaving later in the day. 5. We did not see any visitors leaving the restaurant at the pontoon bridge, they only came for lunch, whereas we came for a photo tour. 6. If you want to experience the whole island I agree with your recommendation to stay overnight and start the island tour early morning. 7. One have to be careful walking to the other island via the sand bank, as we were told that people were often stuck over there and had to be pick up by boat at a “certain” fee. I was there a couple of weeks ago and, as I mention in the guide, the trash situation was not as bad as I was anticipating, but I’m sure it changes with the tides and with the seasons. Thanks. 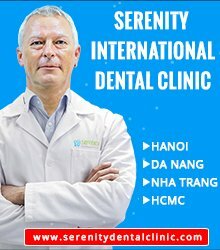 I hope you enjoy visiting Diep Son when you are back in Vietnam.